Songbird prepares for her appearance on The Voice. 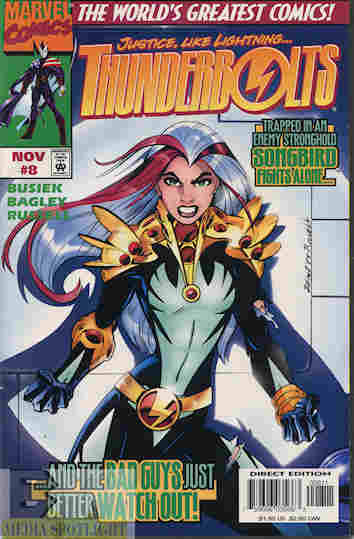 With Techno dead and cut off from the other Thunderbolts, Songbird is on her own when she is attacked by Gold and Silver. Hearing Techno was killed she flattens the Elements with her powers in a rage, and finds the strength to also take down Beryllium and Europium. Meanwhile, Techno used his tech pack before he died to transfer his consciousness into the citadel’s computers and then into a robotic body. As the other superheroes in New York (and in the Marvel universe most of them are based there because that’s where the writers and artists lived pre-internet) battle the Elements Of Doom, the Thunderbolts and the Elements’ betrayed creator come up with a solution to destroy them…which Citizen V gives credit to the Avengers files SHIELD finally released to them. And now that Zemo has what he wants, it will soon be time to drop the ruse and begin the true plan. What they got right: This is Songbird’s story, and she shines very well as she finds the confidence to handle the Elements on her own. Techno/The Fixer gets a new body, which he has no problem with, and it will hopefully be interesting to see how he adjusts to it over time…although we have limited time left in the first major plotline. It was also neat to see the surviving superheroes come together in a big battle. What they got wrong: Honestly, all I have is that Spidey’s quip in the opening splash page went on a bit too long for one panel. Recommendation: I think this is my favorite issue thus far because of how much it does for Songbird’s character, although Jolt is still my favorite Thunderbolt. This is a story line to check out. Posted by ShadowWing Tronix on October 31, 2017 in Marvel Spotlight, Yesterday's Comics and tagged Marvel Comics, Marvel Universe, Songbird, Techno, The Fixer, Thunderbolts.